honey lime enchiladas w/ Spanish coleslaw - On Sunday we had a Mexican feast at my mom + dad's home with all of our family and there was so much delicious food. I posted this for last Friday, but this recipe was so great that I made it again to take to my parent's house. We ate the same meal on Friday and Sunday. These enchiladas are that good. Definitely a new favorite recipe here. sausage, potato and kale soup w/ whole wheat dinner rolls - I saw this recipe on Monday over at Pioneer Woman and it just sounded soooo good. This time of year, I could eat soup every night of the week. My family on the other hand, would get mighty tired of it. But, they enjoyed this soup very much. I should mention that I didn't use kale though. I wanted to, and next time I'm going to, but I didn't have any. I just added what I had in my pantry and that was corn. My family likes corn. creamy chicken vegetable soup with wild rice & spinach salad - On Tuesday evening, I hosted bunco at our home and while my family all went different directions, I was cooking for my friends. I've made this soup before and it is delicious. Filled with veggies, shredded chicken, a creamy base and wild rice, it is very satisfying. Served with my favorite spinach salad and some bread, it's a perfect fall meal. leftover night - Wednesday we had soup and enchiladas leftover from the previous nights. I LOVE leftover night. roasted red pepper and basil pesto pasta w/ tossed green salad [pictured above] - Last night I tried a new recipe that we all LOVED. I have had a jar of roasted red peppers sitting in my pantry for a while and really wanted to use it up. 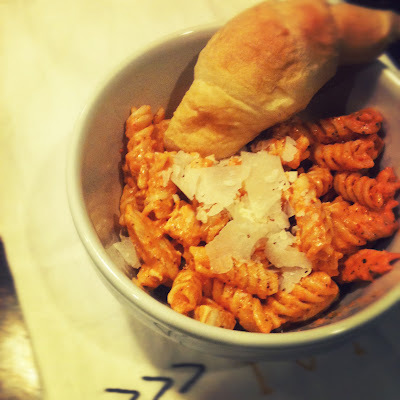 I searched Pinterest for a red pepper pasta and found the perfect recipe. This pasta was creamy and full of flavor. I added grilled chicken for extra protein and didn't tell my kids what was in the sauce until after they tasted it and said they loved it. I got quite the look from Ethan when I told him the sauce was made from red bell peppers. Made my night! chicken and sausage orzo w/ balsamic parmesan roasted cauliflower -Tonight I'm going to try a couple more new recipes and I'll let you know how they turn out. Both of these recipes look delicious and nutritious. homemade pizza - Tomorrow night we've got a fun evening of bowling as a family. Before we go, we'll enjoy a favorite dinner of ours, homemade pizza. Not sure yet what kind it will be. We like pepperoni/pineapple, chicken pesto, and veggie combination.